In 1854, a curious-looking spider was found preserved in 50 million-year-old amber. With an elongated neck-like structure and long mouthparts that protruded from the “head” like an angled beak, the arachnid bore a striking resemblance to a tiny pelican. A few decades later when living pelican spiders were discovered in Madagascar, arachnologists learned that their behavior is as unusual as their appearance, but because these spiders live in remote parts of the world they remained largely unstudied–until recently. At the Smithsonian’s National Museum of Natural History, curator of arachnids and myriapods Hannah Wood has examined and analyzed hundreds of pelican spiders both in the field in Madagascar and through study of pelican spiders preserved in museum collections. Her analysis, focused on spiders of the Eriauchenius and Madagascarchaea genera, sorted the spiders she studied into 26 different species–18 of which have never before been described. Wood and colleague Nikolaj Scharff of the University of Copenhagen describe all 26 pelican spider species in the Jan. 11 issue of the journal Zookeys. 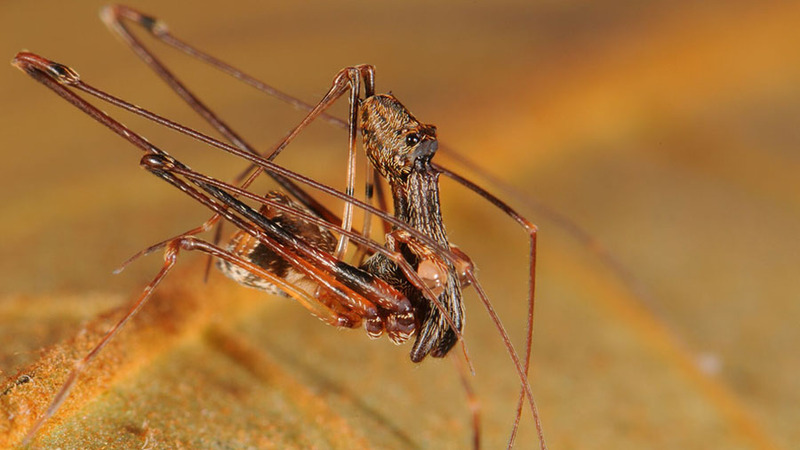 Wood says pelican spiders are well known among arachnologists not only for their unusual appearance, but also for the way they use their long “necks” and jaw-like mouthparts to prey on other spiders. “These spiders attest to the unique biology that diversified in Madagascar,” she said. Pelican spiders are active hunters, prowling the forest at night and following long silk draglines that lead them to their spider prey. When a pelican spider finds a victim, it swiftly reaches out and impales it on its long, fang-tipped “jaws,” or chelicerae. Then it holds the capture away from its body, keeping itself safe from potential counterattacks, until the victim dies. Today’s pelican spiders are “living fossils,” Wood says–remarkably similar to species found preserved in the fossil record from as long as 165 million years ago. Because the living spiders were found after their ancestors had been uncovered in the fossil record and presumed extinct, they can be considered a “Lazarus” taxon. In addition to Madagascar, modern-day pelican spiders have been found in South Africa and Australia–a distribution pattern that suggests their ancestors were dispersed to these landmasses when the Earth’s supercontinent Pangaea began to break up around 175 million years ago. Madagascar is home to vast numbers of plant and animal species that exist only on the island, but until recently, only a few species of pelican spiders had been documented there. In 2000, the California Academy of Sciences launched a massive arthropod inventory in Madagascar, collecting spiders, insects and other invertebrates from all over the island. Wood used those collections, along with specimens from other museums and spiders that she collected during her own field work in Madagascar, to conduct her study. Her detailed observations and measurements of hundreds of specimens led to the identification of 18 new species–but Wood says there are almost certainly more to be discovered. As field workers continue to collect specimens across Madagascar, “I think there’s going to be a lot more species that haven’t yet been described or documented,” she said. The spiders Wood personally collected, including holotypes (the exemplar specimens) for several of the new species, will join the U.S. National Entomological Collection at the Smithsonian, the second-largest insect collection in the world, where they will be preserved and accessible for further research by scientists across the globe. All of the pelican spiders that Wood described live only in Madagascar, an island whose tremendous biodiversity is currently threatened by widespread deforestation. The new species add to scientists’ understanding of that biodiversity, and will help Wood investigate how pelican spiders’ unusual traits have evolved and diversified over time. They also highlight the case for conserving what remains of Madagascar’s forests and the biodiversity they contain, she says. Funding for this study was provided by the Danish National Research Foundation and the National Science Foundation.